I haven't been feeling particularly verbose here on my blog lately. A mix of being tapped out from writing at work and a little bit of having nothing to say is a bad combination. My imagination feels stagnated lately. The everyday routine of commuting to work, working and commuting home aren't the most interesting things to write about. Today was a lazy day of crafts, buying socks, and now watching a marathon of the British version of Skins series 1 on Netflix. Hopefully later I'll get to drink some wine. This was my outfit for my easy going day because even though I didn't do much, life is an occasion and I'm always be prepared for adventure. This super soft skirt and leggings made this outfit because its cute, but I can lounge around now in my toasty warm house in it too. So many people can't stand winter, but I love it because its the perfect excuse to waste a day watching tv and reading. "So many people can't stand winter, but I love it because its the perfect excuse to waste a day watching tv and reading." ---> so true! Lookin' lovely also. i wanna have a snowing place to walk in, becaause there i can mix more outfit to wear like you doing. the sweater, shirt, and scarf are so delicate and lovely! and i know what you mean. this saturday is especially easy-going for me - i spent half the day in pajamas! I love winter. It absolutely suits my desire to hibernate, haha. I love getting cozy by the fire with a good book and a glass of wine. Or making crafts and watching Skins (love that show, especially the first series). This outfit is too adorable. 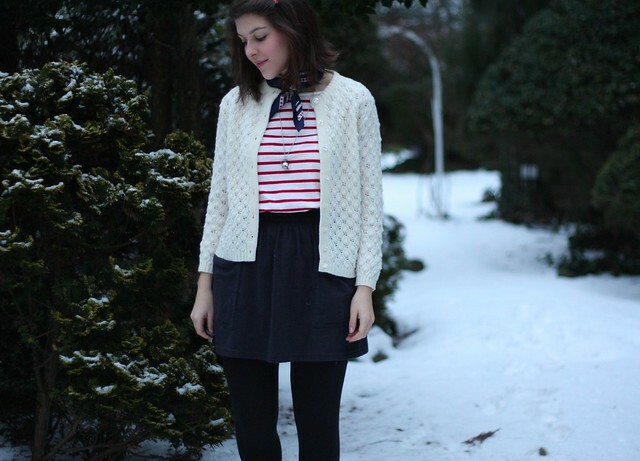 I love the cardigan, especially, and the striped tee. So cute! I had no idea that Skins was a British TV series. All along I thought MTV ripped off the movie KIDS and decided to make it a series. Very curious now. Love it. looks nautical. you look great! Oh your easy going day outfit is so great, I love the stripes with this scarf its so classy! Your textured cardi is so cute! I want to see the British version of Skins before I see the MTV version! i have a bottle of wine in my fridge ready to go. i'll send you a virtual glass. 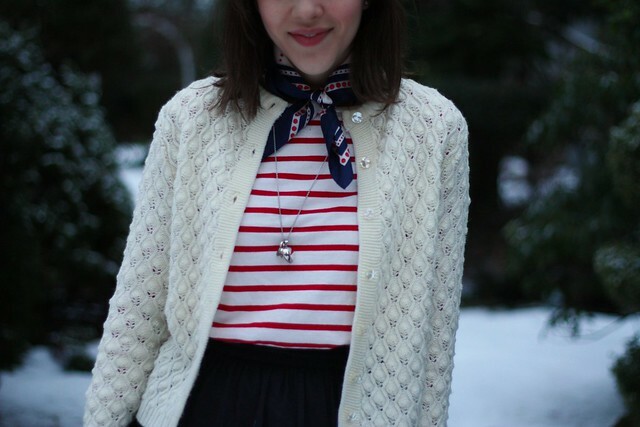 you look very french and sailor-esque, love it! I love the sweater and little foulard! so cute! There's an ebb and flow to life. Downtimes re-charge our battery for more active periods. Winter rest will make Spring all the more springier! Ooooh this is just too cute! I love the sweater and the stripes! Perfect! i <3 the skins so much. i am not sure why they are doing a US version..the British version is perfect. you look beautiful in this outfit. i love the simple color combo & the snow pictures are lovely. Winter really is perfect for cozy days in, it's true. 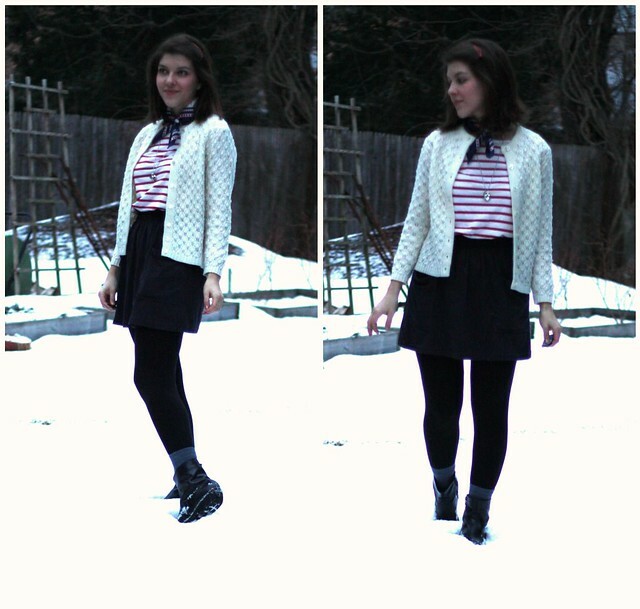 I love this outfit, especially that adorable cardigan! I just found your blog and it is so sweet! 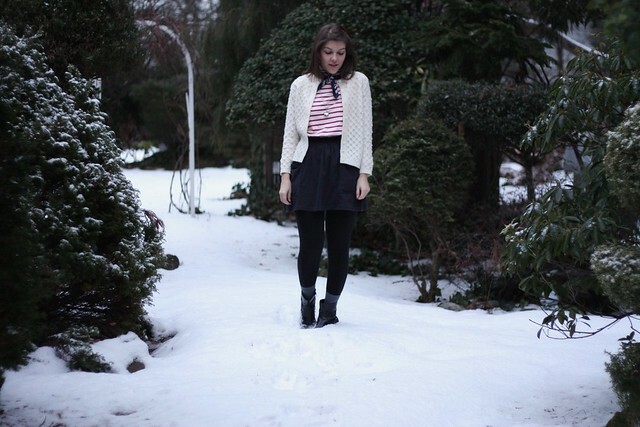 I'm following :) I love this outfit - you have really cute style. Your lazy day sounds just perfect. I absolutely ADORE Skins - I have all the series on DVD and could watch them over and over again! So good! Oh, you are so gorgeous! I love the sweater. You look divine in the snow. You look adorable! That sweater looks so cozy and the scarf, so you! beautiful!!! I don't know what to say other than that or I would! I'm quite a fan of winter... I just wish it was broken up with shots of summer more often. Lovely sweater, and you're the first person I've liked in leggings for a long time! You look adorable! I love the scarf. I have been feeling the same way lately about blog-writing. I just am SO tuckered out after a day at work & often too sleepy to come up with anything interesting to write.